Before we look at the work of the pastor we must look at the pastor himself. The pastor by definition is a shepherd, the under-shepherd of the flock of God. His primary task is to feed the flock by leading them to green pastures. He also has to care for them when they are sick or hurt, and seek them when they go astray. 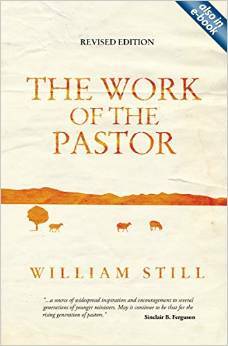 The importance of the pastor depends on the value of the sheep. Pursue the pastoral metaphor a little further: Israel’s sheep were reared, fed, tended, retrieved, healed and restored — for sacrifice on the altar of God. This end of all pastoral work must never be forgotten — that its ultimate aim is to lead God’s people to offer themselves up to Him in total devotion of worship and service. Many who are called pastors, having lost the end in view, or never having seen it, become pedlars of various sorts of wares, gulling the people and leading them into their own power. And when they fail to gather a clientele for their own brand of merchandise they uptail and away, for they are not really interested in the flock of God; they were using them only as a means of their own aggrandisement, to boost their ego and indulge their desire for power. ‘The hireling fleeth, because he is an hireling [he is in it for what he can get out of it], and careth not for the sheep’ (John 10:13). Whereas the Good Shepherd careth for the sheep — even unto death; and, therefore, seeks so to care for them that He may at last present them without blemish unto God. The assumption implied and often implicit in Calvin’s handling of the theme of the Christian life, is that only Christians are in a position to live it. The Christian life is for Christian men only. The point looks obvious as soon as it is stated, but, nevertheless, we need to dwell on it, not only because it is fundamental to everything that follows, but also because it would be rash to assume without discussion that twentieth century churchmen (and chapel men!) are of Calvin’s mind as to what a Christian is. To Calvin the Christian is utterly different from other men. And if I may add to Dr Packer’s quotation, Christian men are different from other men, particularly in believing that there is an alternative destiny for men. So that the pastor called to feed the sheep may find that his first calling is to evangelise the goats! Preach the word, be instant in season and out of season: convince, rebuke, exhort with all long suffering and teaching. For the time will come when they will not endure sound teaching, but their ears will itch for tales and fables and they will refuse the truth. But watch thou in all things, endure afflictions, do the work of an evangelist, make full proof of thy ministry (2 Tim. 4:2—5). This is the work of pastor, teacher and evangelist, combined. There is no clear distinction in the Acts between what may be called Paul’s ‘evangelistic ministry’ and his ‘teaching ministry: In both, we find him expounding the Scriptures (and writing new Scriptures!). When his hearers were mainly unconverted we might call the ministry evangelistic or kerugmatic (e.g. at Lystra, Athens, and at Cornelius’ home); and when mainly Christian, we might call the ministry teaching or didactic. But there is a wide range between these situations, and some of Paul’s evangelism involves major pieces of Old Testament exposition. Whether this be a true interpretation or not, it does serve to underline the fact that it is misleading to identify ‘preaching the Gospel’ with ‘preaching an evangelistic message. All the evidence of the New Testament goes to show that the apostles’ evangelism was a teaching evangelism. All the characteristic messages in Acts have the kerygma at their heart; but it was doctrinal preaching all the time, based on the Scriptures, expounding and interpreting them. ‘Paul, as his manner was… reasoned (or argued) with them out of the scriptures, opening and alleging …‘ (Acts 17:2, 3). Rightly understood, apostolic evangelism is not a matter of exhorting and pressing men to come to Christ until there has been a proclamation of the mighty acts of God in Christ in reconciliation and redemption, and on the basis of this, the free offer of His grace is made to all who will receive it. It follows, therefore, that the church’s evangelism ought to be one in which all the counsel of God is made known to men. We need a recovery of belief in the converting and sanctifying power of the living Word of God in the teaching of the pulpit, and its ability to transform the lives of men and produce in them the lineaments and fruits of mature Christian character. He will be convinced [convicted] of all, judged, examined, searched, sifted by all; and thus the secrets of his heart are made manifest; and so falling down on his face he will worship God, and report that God is among you of a truth (1 Cor. 14:24, 25). Of course, the sense of the presence of God, and the cutting edge of His Word, may make him mad, so that he rushes out, bangs the door, and goes and reports you to the authorities … He may come back! This is equally to be expected where the power of the mighty God is unleashed. You cannot expect to have the one without the other. But too many today pin their faith for fruitful evangelism on harping for ever on a few Gospel facts isolated from the broad and full context of the whole Bible. We were thinking about this in our fellowship in a discussion of a programme ‘Instant Salvation broadcast by the BBC’s Radio 3, when our lawyer elder, Francis Lyall, who had spent a year in Canada and the United States, pointed out that Gospel facts are poured over the air for twenty-four hours every Sunday across the water, and few there can really claim to be ignorant of them. ‘But he said, ‘there seemed to me to be little evidence that the dispelling of ignorance on that level had much effect in increasing the vital Christian constituency.’ We have had in our congregation the curious experience of a number of academic evangelicals of different denominations coming to church and complaining that they could not take their unconverted friends to a ministry of continual systematic teaching of the Word. ‘Why not? Some of the most thoroughly converted people I know were converted through a teaching ministry. One of them, converted in our church hall, became President of the Cambridge Inter-Collegiate Christian Union. Certainly, we must not make the disastrous error of going on preaching what is called the simple Gospel, isolating a few mere facts, wonderful as they are, until the last manjack is known to have been converted. What are all the hungry sheep going to do until then? Jesus will tell you what to do with them — not in word, but in deed. When the Galileans made it clear that they wanted the fruits of Christ’s kingdom in healing to their bodies, but not His teaching about the nature of the kingdom, He turned and ran from them up a mountain, to teach (feed) His disciples. For our Lord came to do three things, in an ascending scale of importance: to show forth the powers of His kingdom in healing the sick; to teach the tiny nucleus who would listen to Him and who were to be the hope of the church after His ascension; and — His greatest reason for corning — to die. Next to that (His death and rising, which gave sanction and power to all the rest) He must teach a nucleus of the laws of His kingdom; so He gave them the Sermon on the Mount. Such teaching is essential food for sheep. It is to feed sheep on such truth that men are called to churches and congregations, whatever they may think they are called to do. If you think that you are called to keep a largely worldly organisation, miscalled a church, going, with infinitesimal doses of innocuous sub-Christian drugs or stimulants, then the only help I can give you is to advise you to give up the hope of the ministry and go and be a street scavenger; a far healthier and more godly job, keeping the streets tidy, than cluttering the church with a lot of worldly claptrap in the delusion that you are doing a job for God. The pastor is called to feed the sheep, even if the sheep do not want to be fed. He is certainly not to become an entertainer of goats. Let goats entertain goats, and let them do it out in goatland. You will certainly not turn goats into sheep by pandering to their goatishness. Do we really believe that the Word of God, by His Spirit, changes, as well as maddens men? If we do, to be evangelists and pastors, feeders of sheep, we must be men of the Word of God. Now, consider what this means: the Word of God, the law of God, ‘the royal law according to the scriptures ‘the perfect law of 1iberty is a sort of rational, verbal, imprint, transcript expression, or descriptive mould of the character of God, which character became incarnate and human in Jesus Christ. ‘He is,’ says the writer to the Hebrews, ‘the character, the express image [the matrix, stamp, engraving] of the Person or substance of God’ (Heb. 1:3). But this written Word, summed up in the incarnate Word, not only expresses what God is like, but is and becomes by the operation of the Spirit of God, the nourishment by which we become like Him also. To be a pastor of the sheep, a feeder of the Word to others, you must be fed yourself. No man can make the Bible become the Word of God for today (I know that it is, I am not selling you Barth at his worst!) to feed the flock of God by simply ‘passing on’ what it says. Food has to be assimilated and absorbed by digestion. An atheist could ‘teach’ the Bible, and some try to in our schools! That will not do. The Word became flesh, and it must become flesh again in you. It is godly character which is the real pastor, or is the basis of him. You have heard the saying that a man’s words could not be heard because what he was and did spoke so loudly. Well, it takes the whole Word of God, impartially received but rightly divided, to make a rounded, full-orbed character, which every pastor, within his God-given limitations, must be. ‘Brethren,’ says the Apostle, ‘be not adolescents in understanding [in your minds]: howbeit, in malice be infants [harmless as doves; having no part with evil, so that, standing back from it, you may see it as it is, in contrast to its opposite], but in understanding, be full-grown [teleioi, mature, manly]’ (1 Cor. 14:20). To be true pastors, your Whole life must be spent in knowing the truth of this Word, not only verbally, propositionally, theologically, but religiously, that is, devotionally, morally, in worshipping Him whom it reveals, and in personal obedience to Him whose commands it contains, in all the promised grace and threat of those commands. To be pastors you must be ‘fed men’, not only in knowledge, but in wisdom, grace, humility, courage, fear of God, and fearlessness of men. I despair of some who come to our church and who read our literature, because what they hear and read is only one item of their spiritual diet. Indeed, they eat very little of anything but like children play with their food. That is why they are so thin. They juggle with it as if it were something to sell, not eat, and are not very sure which item is the best-selling line. Eat it, eat it whole. All or nothing. For it is only ‘all or nothing’ devourers of the Word of God who will ever be or do anything for God. Extreme? Yes; but there is no other way of knowing for sure that this is the way of ways than by swallowing the message whole. And that is not an experiment; it is a committal. But obedience to the truth demands nothing less. Knowledge without obedience is useless. You must be doers as well as hearers of the Word in your own lives. This alone will make the image of Jesus Christ appear in your life so that you exemplify your teaching in your own person before you begin to teach. Then your hearers will receive both the teacher and his teaching. There is, of course, only one Teacher, the Holy Spirit (cf. John 14:16, 17,26; 16:7-15). And if the Holy Spirit is not in our hearts, in our life and in all our teaching of the Word of God (and He will not be if our characters are not being moulded according to the moral and spiritual pattern of the Word), then we had better not open our mouths. For there is nothing so boring, stale, flat and unprofitable as holy things retailed in the absence of the Spirit. This is one of the devil’s most cunning tricks, to cause the Word of God to be dispensed by lazy, sleepy, moribund creatures, who find preaching the most burdensome part of their work and cannot help showing it. I have heard people praying, preaching and teaching, and have been so desolated and my heart has been so opposed to the whole depressing exercise, that I have almost wished the things they said were not true so that I could refute them. The whole soul of man, even ungodly man, cries out against the Word of God as a dead thing. Where the Spirit of God is, there may and will be unpleasant manifestations, but there will not be boredom. Division there will be, some for and some against — that is another story — but there will be life, and the Word of God will cut and melt ice, even if it confirms the unmeltability of some ice, which is even hardened by the Word of God. Change the metaphor to steel, and you will understand what I am trying to say. Things will happen. The preaching of the Word of God, when it flows through a living vessel dedicated utterly to the Master’s use, is not only an event in the lives of those who hear it but becomes, first, a decisive act, and then, necessary food for their souls. My whole concern in my work of trying to make pastors (and I have ‘made’ too few, although I have had many men through my hands) is that they become men of God; then, the pastoral work will look after itself. It will still have to be done. But the man of God is made for that. The question is: Are you on the way to becoming men of God? I am not really concerned with anything else until men are. I am sure that some of you are. None of us has arrived! Do you, then, know the Spirit of God teaching you the Word, in private, and in the fellowship of the saints? We learn in fellowship. This may have nothing to do with lectures, although it should have everything to do with them if your lecturers are men of God. Unless the Word of God works for you, and solves the problems of your own life (I do not mean perfectly, but in the sense that you know where you are in relation to them), how can you expect that you will be able to make it work for others? One of the great sorrows of my life is that men who have gone through my hands are out in the ministry and, because of what seems to be disobedience to the Word, or has not had a chance to do its own work in them. What can they do for others? Nothing! Then, when you are sure that God has laid His hand upon you to be His child and servant as pastor and teacher of the Word of God – I wonder what proportion of you will yet find out that you were never called by God to do this and will therefore be spewed out of the ministry by the Spirit of God in the next few years to become something else, deputation secretaries, etc. (this is not to despise deputation secretaries, for not all deputation secretaries are rejects from the ministry; some had the courage and humility in the first place to know their God-given calling, not being carnally ambitious) — when you are sure of your calling as pastors and teachers, then you must be wholly geared to that life. This involves, first, the building up of your own faith by feeding on the Word of God; then obeying it; so that you may make your sole task in life to teach the whole Word of God to your flock. The whole Word: this is pastoral work. Take Paul’s example in Ephesus (Acts 20:24-32). We are not called to make a crowd of worldly folk happy — even worldly evangelistic folk happy — but so to labour amongst them that, through many tribulations, discouragements and misunderstandings, we form a faithful people of God, however small a remnant of the total congregation that may be. There will be many opposers, some very surprising ones! I could bring ministers of various denominations to testify that, although the unconverted in their congregations made their lives miserable, the most fiendish persecutions have come from evangelistic people who wanted a perpetual preaching of that part of the Gospel which they thought (often wrongly) did not touch them, and who, when the Word of God in its fullness was unleashed upon them, went virtually mad with rage. There is nothing too vile for such people to do when their futile round of evangelistic meetings with its patronage of the unconverted has been ended, and the myth of their conceited superiority has been destroyed. It takes a courageous man in these circumstances to preach the whole Word of God without fear or favour, whoever it hurts — himself, his loved ones, his friends, or his enemies. Having seen that a pastor is called to live by the whole Word of God in order that he may teach the whole Word of God, how is he to begin? There are, generally, three methods that I know of. Firstly, he can follow the church year and broadly cover the substance of the Word of God annually. He can preach through the Bible, book by book, alternating Old and New Testaments, and different parts of each judiciously, to give a balanced diet. This demands continual specific guidance of the Holy Spirit. Each situation is unique and only God Himself can tell a man the order in which to take the books. Do you think you would know divine guidance here? Secondly, the pastor can teach the Word of God, subject by subject. This may be done evangelistically where there is not much of a clue as to the fundamentals of the Gospel, just as he may turn to more ‘edifying’ subjects amongst a congregation thoroughly grounded on the Word. Thirdly, the pastor can preach his way through one of the creeds, or through the chapters of the Westminster Confession of Faith, or the Thirty-Nine Articles. But, remember, it is not syntheses of the Word of God, not doctrinal presentations of the Word, but the very Word of God itself, read, commented upon, expounded, and its parts vitally and intelligently related, that does the work in men’s hearts. For example, for fifty years, in one place, I have preached through the Bible, book by book, chapter by chapter, verse by verse, New Testament and Old Testament several times. I have written Daily Bible Reading Notes continually since 1947, and have commented on the whole Bible several times. Now, the principal product of this is not a mass of sermon notes, statistics or a pile of booklets containing at least two commentaries on the whole Bible. The product is the lives that are loving and serving Christ in various parts of the world, not least in the ministry in its various denominations. Nobody is going to exclaim over my sermon notes, or prize my Bible Reading Notes as literary or scholarly gems — although people who have despised them have had to change their minds when, in some personal need, they have found in them correction for their lives and food and comfort for their souls. I hate writing this and laying myself open to possible misunderstanding, but even in the ministry the criteria of pastoral work may be mistaken. Indeed, the criteria by which you judge what you are reading now may be seriously mistaken, and you may be wondering when I am going to get down to my subject. But this is my subject: first, feeding the flock of God, then, tending them in their need. All this, the healing as well as the feeding, flows from the ministry of the Word of God in the power of the Spirit. If only I could make you believe that! My pastoral work of personal dealing, considerable though it is, has been greatly reduced through the years because the building up of people’s faith, by the ministry of the Word of God, solves so much in their lives. It enables those who receive it and seek to live by it to understand and solve so much in other lives, that instead of becoming a liability on my time and energy, they become pastors themselves. Indeed, one of the features of such a radical and total ministry of the Word is that it thrusts so many into spiritual and social work that I can hardly keep a congregation together on account of their scattering throughout the land, and indeed, the earth. I don’t know about other countries, but in Scotland the great emphasis today is on the witness of the layman. Quite right! It should be. And there is only one way to make Christian laymen rise to their responsibilities fruitfully, and that is to turn them into thoroughly Christian characters. You will then find that even in a comparatively small fellowship there will emerge a surprising range and variety of working gifts of the Spirit. From time to time I am tempted to try to count how many of our folk are engaged in medical, nursing and psychiatric work; social welfare work amongst babies, children, delinquents and maladjusted adolescents; in geriatrics, health visiting, serving as Christians in law, civil service, teaching, lecturing, etc. ; applying their skills as Christians in the world with a witness to give and a task to do. But there are so many that I cannot count them, and I am not going to. The true statistics are kept ‘upstairs where the computers and computors are quite accurate, even though they do not publish their figures down here. Now, what are the basics of a ministry which transforms the character of all sorts of people? First, the pastor must know Christ, really know Him, and live his life as sifted by His all-searching holiness all the time. This is the only way to produce any fruit, to say nothing of any satisfaction, nor indeed any fun in his life. Second (and it does not follow that all such thoroughly Christian characters will be called to the ministry of the Word), you must know that God has called you with a heavenly compulsion, whether you want it or not, to be an evangelist, pastor and teacher of His Word. Third, you must find out His will for your life, and His place for you, and obey the fiery cloud, as Israel did in the wilderness, as your only safety and satisfaction, whatever your inclinations are, or what your loved ones, sweethearts, friends, or even your enemies say. You must remember, of course, that God is the most sweetly reasonable and considerate Person in the world when we give Him His place. But also remember that He is ruthless to the disobedient. Fourth, having been called or appointed to minister to a local congregation, begin to minister the Word of God to them at once, depending for all you are worth on the Holy Spirit, and believing that this is the biggest thing you can do for them in all the world. This is your life: not a part of it, but your life. Other things come in, of course, but this is your life, the most thrilling life anyone can live on earth, to expose a group of people, Christian or not, to the all searching eye of the Word of God. Do you remember what the writer to the Hebrews says about it? For the Word of God is quick [living] and powerful [efficient, energes], and sharper than any two-edged sword, even penetrating to the division of both soul and spirit, of joints and marrow and is a discerner of the thoughts and intents of the heart. And there is not a created thing unapparent before Him, but all things are naked and laid bare to the eyes of Him with whom is our account (Heb. 4:12, 13). As you begin, let the people know that your ministry of the Word is going to be soaked in prayer; your own, and that of those who will join you. Set a time for prayer, but do not say there will be prayer if anyone comes, but rather that you will be there to pray at such-and-such an hour and that you will be glad to join with any who come. The fact that you mean business will be the surest indication to your people that God means business with them. If this continues and grows, as it must if God be with you, then a power-house will be created which will determine your ministry. This outpouring of prayer will guide you in your choices and sequences of teaching, and provide impetus, thrust, drive and power. It will produce in you that compassion and tenderness that will mark your ministry as of God, along with that authority and sternness which will cause the people to know that God is in the midst of the work. He will work, slowly as it may seem at first. Your quiet persistence — this charge, or parish, or living is not a mere stepping-stone to a better appointment: God has caused you to become pastor to some souls here who are as valuable to Him as any in the world—your quiet persistence will be a sign that you believe God has a purpose of grace for this people, and that this purpose of grace will be promoted, not by gimmicks, or stunts, or new ideas, but by the Word of God released in preaching by prayer. There will soon be evidence that God is at work — and the devil will rouse himself too! The first sign may be that believing folk who may have grown cold and worldly, will begin to loosen their purse strings out of thankfulness to God for His living Word, and the finances will improve. This is the least of the signs, but it is almost always the first to appear in the reviving of a church. Then this becomes a witness to the nominal in the midst, the materially minded, that a faithful ministry pays financial as well as spiritual dividends. There will be opposition, and you may be quite surprised at where it comes from — notably those who have been ‘running the church’ and who have turned the church of Jesus Christ into their private preserve and hobby. Those whose daily lives do not match up to their profession will begin to be disturbed. Those who maintain class distinctions, social or intellectual, in the congregation, and all who put up with the fulminations of a young minister as long as he does not seriously interfere with their status quo, will begin to panic. Amidst all this, consciences will be stirred and lives will be searched, home life, business, church activities examined. People will begin to take sides, objections to you and to what you preach, and how you preach it, will become increasingly plausible (but quite irrational when you consider them). Your manner, length and style of preaching, etc. will all be torn to pieces. Withal, there will appear a nucleus of responsive souls all very imperfect; some perhaps quite objectionable, and possibly, alas, without a good witness in the church and community; some toadying to the new man and to the new found livingness of his message in the hope that, siding with you, they may escape the searchingness of the Word, and put themselves in your good books. But a nucleus will appear, of whom several will be seen to be truly devoted to God, and bound together by ties of holy love. These will honour you for your faithfulness to God. God will even provide you with a suitable comforter, someone to care for you in the upheaval, and you will begin to see the church taking apostolic shape before your eyes. You will see the Word changing and exposing lives, and you will marvel and tremble and rejoice and fear all in one. You will be bowed in profoundest humility before God when you see that He has called you to follow in the train, however far behind, of the first Apostles, and the prophets, teachers and martyrs of the centuries. In this work we must not be afraid of upset. We must not go out of our way to create it; we don’t look for trouble, but seek peace. But if we are going to be faithful to God and to men, there will be upset. The great thing to know is that God is at work creatively, through His Word, in answer to the prayers of His people. There is not a greater task a man can perform in the whole world than this, that he is being used to release the all-searching Word of God upon a company of needy souls. It is the most amazing thing. It works! God works. His Word works. Prayer works. The Spirit works. Do you still think I am merely skirting the fringe of my subject? I can hardly hope to give you more than an introduction to it. If I can expose to you some of the multifarious reasons why the Lord’s called servants do not become true and faithful pastors and teachers of the Word and feeders of the sheep, then I will have done you a lasting service. The greatest failure is not that you make a mess of your first pastorate by not knowing enough human psychology, necessary as it is (it is all in the Bible, anyway!). The greatest failure is that you fail to minister the Word of God in any effectiveness or fullness to the people. The ministers who are the greatest failures are not necessarily those who make such havoc of a church that they have to pass on and leave someone else to put humpty dumpty together again (for that may mean merely re-establishing the synthesis of the church and the world again), but the greatest failures are those who, having tried to run Christ’s church as a moneymaking racket, a clockwork train, or a social free-for-all, depart and leave a spiritual wilderness behind them, in which the one thing that is not known at all is the Word of God. A further word: the whole current of the divine has to pass through you, His servant, and little though you may know what is going on in the hearts of your people at first, there is a great price to be paid for being the ‘conductor’ of divine truth and power. Change the figure: this is sacrificial power, and you will have to die to release its truth into human hearts. You will have to go down into a new death every time you bring forth God’s living Word to the people (2 Cor. 4:12). You will have to die, not only to your own sin, but to self in many of its most seemingly innocent and legitimate aspects. Only then can the death and resurrection power of Jesus Christ be communicated to men, and we dare not do less for any people than this. If we do less, we will have to answer before God one day. But you may be saying, ‘Yes, but when are you going to come to dealing with people individually in their problems?’ There are two answers, and the lesser answer I give first. (We will deal with this in more detail in the next chapter.) Take, for instance, hidden problems. Consider what a revelation it may be to those who are truly seeking to live the Christ-life in its vital death and resurrection power, to know that much sin and evil in themselves about which they lament and beat their breasts, is not the mere operation of the principle of inbred sin in their life, but is due to the machinations of a real live devil. He has fastened on their flesh and concealed himself in the folds of their weak human natures so that they go on constantly thrashing themselves for their sinfulness. They never make the self-liberating discovery that there is a devil to be driven out of their lives. Why did Jesus call Peter ‘Satan’? This we may learn only from the Word. Now it may be that such a soul-searching ministry appals you, but read the New Testament and you will see that it is inseparable from a living communication of the Word. God is constantly calling men, tugging, drawing, challenging, chivvying them by the Spirit-winged thrusts of His Word on their consciences, to search themselves in His Presence. It is going on now. There may be division among you about what I am saying. I don’t need to know the fact of it, for I know something of the power of the Word to create reaction in human nature, and if I am to help the helpable, I must — rather the Word must — antagonise others, although I must try not to add my own offensiveness to it. But if dealing with people’s problems is all you want, you have missed my point. The real and greater answer is that I have already been dealing with it. Although the Word of God tackles not only obvious problems, but unearths — and ultimately solves — hidden ones too, the real answer is that the living Word thoroughly, adequately and graciously deals with our people, problems and all. Through the death the pastor must die to self, the life of Christ appears in his people. There it is: Conflict! Cost! Crucifixion! ‘Who is sufficient for these things?’ None of us. ‘Our sufficiency is of God.’ But it is when we see the cost of a real work of God in terms of human agony and sacrifice that we see whether our call to the ministry is of God or is a mere romantic notion. I once heard a quote not kwowing where it came from. On searching the net I discovered it was a quote from this first chapter of this powerful little book. It’s all about keeping the main thing the main thing, Sheep need a shepherd. A shepherd need to feed the flock. To properly feed them to grow to maturity he need to feed them the whole word of God. It’s simple yes, but their is much more to it and many shepherds will find they fail dismally and need to repent and feed their unhealthy sheep proper food and that is hard work and you will need to spend much time on your knees and in preparation and to die to yourself and to critisism and be obediend to God by His Spirit.